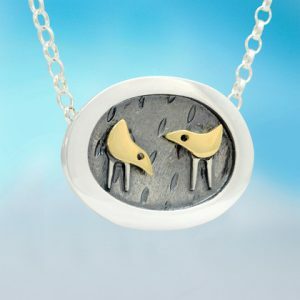 View cart “Alan Ardiff Two for Joy Pendant” has been added to your cart. Alan Ardiff Busy Bee Pendant. Sterling silver pendant with 18k spinning honey bee with a 46cm (18″) chain. Alan Ardiff Gold Star Pendant. Sterling silver pendant with 18k gold spinning star. The pendant has a 46cm (18″) chain. Alan Ardiff Hair of the Dog Cufflinks. Sterling silver cufflinks. Alan Ardiff Heart of Gold Bracelet. Sterling silver bracelet with 18k gold heart. Gold heart is reversible and is backed with a silver heart. Heart piece is bound on a 19cm (18″) chain. Matching earrings & pendant available. Alan Ardiff Heart of Gold Cufflinks. Sterling silver square cufflinks with 18k gold heart centres. Alan Ardiff Heart of Gold Drop Earrings. Sterling silver square drop earrings with central 18k golden heart. Matching bracelets & pendant also available. Alan Ardiff Heart of Gold Pendant. Sterling silver square pendant with 18k gold heart centre. It has a 46cm (18″) chain. Matching bracelets and earrings also available. Alan Ardiff Heart of Gold Stud Earrings. Mini stud sterling silver earrings with 18k gold heart in relief. Matching bracelets & pendants also available. Alan Ardiff Heart to Heart Pendant. Sterling silver rectangular pendant with two inset 18k gold hearts set on revolving cogs on a 46cm (18″) chain. Alan Ardiff Just for You Pendant. Sterling silver rectangular pendant with inset swaying 18k gold flower on a sterling silver stem. Chain is 46cm (18″) in length. Alan Ardiff Never the Twain Cufflinks. Square sterling silver cufflinks featuring stylised portraits of a man and a woman in relief. Alan Ardiff Sun Moon & Stars Stud Earrings. Sterling silver circular stud earrings with an 18k gold sun encircling the silver moon. Matching pendant & bracelet available. Alan Ardiff Two for Joy Pendant. Sterling silver oval pendant with two inset 18k gold pecking birds. Chain is 46cm (18″) in length. The Jill Graham Ember Hook Earrings are textured silver with a distinctive design in Gold leaf, giving it a sensual tactile quality. They make for the perfect treat yourself gift or that special gift for a loved one. The Jill Graham Ember Stud Earrings come in Textured silver with a distinctive design in Gold leaf, giving it a sensual tactile quality.